Pinterest scrolling always turns up interesting finds... like this one: "Gluten Free Bread in Seconds". 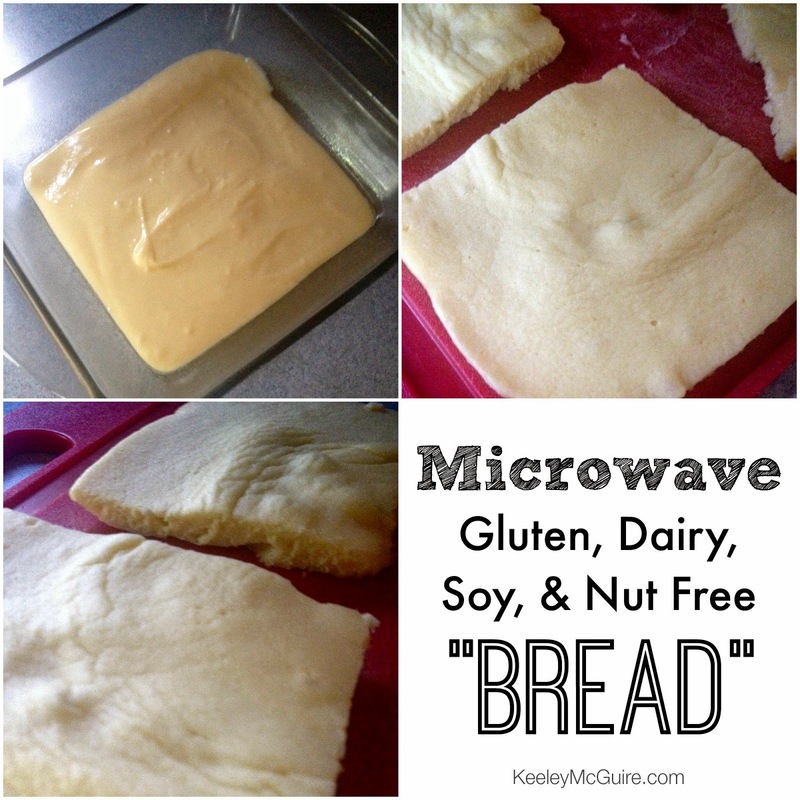 It's for a microwave, instant gluten free bread (that can also be made dairy free, as well as, nut & soy free). I was curious... so I gave it a try! The result... I'll explain more below, but I'd really call this a "Gluten Free Pancake in Seconds" rather than "Bread" since that's more the texture and consistency. Either way, fun to try in a pinch. The original recipe calls for using a plastic sandwich container to microwave it in. I wasn't comfortable putting a cheap sandwich container in the microwave that long, so I spread out the batter into a glass baking dish instead - figuring I could cut it into slices, rather than in half like a bun, like the originator did. As I said above, the consistency is really more of a pancake than a slice of bread. Still a nice quick-fix if you find yourself out of bread while packing lunches and don't want to go to the trouble of making a pancake on the stove top. Other items to note: The recipe says it take 90 seconds. I assumed since mine was in a thinner layer it would cook more quickly. Wrong. It took just over three minutes in the microwave to get mine cooked through. So, keep that in mind. Back to lunch: Since it was really more like a pancake, I decided to use my heart shaped cookie cutter on it and create mini SunButter sammies. One of Little Miss favorites! 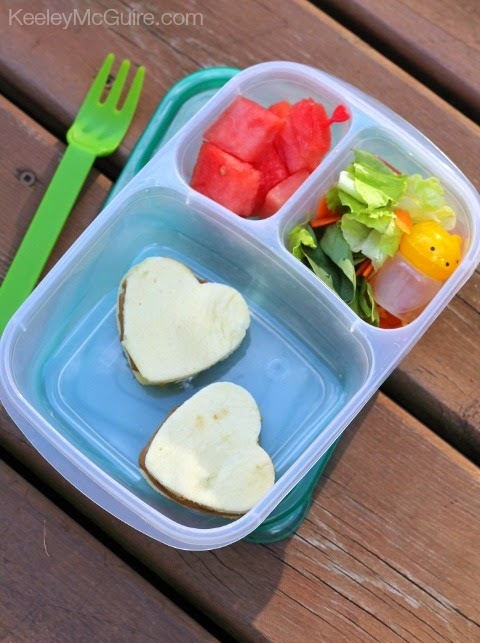 Also packed is a side salad and watermelon in an EasyLunchboxes container for a fun, allergy friendly lunch!